We’d love your help. Let us know what’s wrong with this preview of Love & Ruin by Paula McLain. To ask other readers questions about Love & Ruin, please sign up. Why were some chapters written in italics? I couldn't discent how those were different from the rest of the book. I confess that I wasn’t a fan of the Paris Wife and I liked Circling the Sun even less but Love and Ruin was a success for me. Historical fiction, this novel chronicles the relationship between Hemingway and Martha Gellhorn whom he met while still married to his second wife, Pauline Pfeiffer. I think Gellhorn was the draw for me. I’ve always been fascinated by her bravery and commitment as she became a renowned war correspondent and paved the way for other female reports who followed. Hemingway I confess that I wasn’t a fan of the Paris Wife and I liked Circling the Sun even less but Love and Ruin was a success for me. Historical fiction, this novel chronicles the relationship between Hemingway and Martha Gellhorn whom he met while still married to his second wife, Pauline Pfeiffer. I think Gellhorn was the draw for me. I’ve always been fascinated by her bravery and commitment as she became a renowned war correspondent and paved the way for other female reports who followed. Hemingway is portrayed as the great American writer at the height of his career and as, by the accounts I’ve read, jerk that he was. A good work of historical fiction for me is one in which the author perfectly sets the stage of what is happening around the characters not just with what is specifically happening with them. Starting with the prologue and continuing throughout, Paula McLain does a fabulous job of depicting the time and all of the places and what was happening in the world not just in the private and sometimes not so private world of Martha Gellhorn and Ernest Hemingway. Even with this broad view of th 4+ stars. A good work of historical fiction for me is one in which the author perfectly sets the stage of what is happening around the characters not just with what is specifically happening with them. Starting with the prologue and continuing throughout, Paula McLain does a fabulous job of depicting the time and all of the places and what was happening in the world not just in the private and sometimes not so private world of Martha Gellhorn and Ernest Hemingway. Even with this broad view of the world with the Spanish Civil War, Paris and London and other places before and during WWII, and even though this is a fictional account, I felt as if I were reading a memoir. Because of this intimate perspective that McLain creates it’s easy to admire Marty’s independence and desire to do “something”. Another sure sign of a good work of historical fiction based on a real person for me is that I want to know more about them and I want to get a feel for how well they are portrayed. This was another strength of the book as I found myself taking time to read some online accounts of Gellhorn’s life. They reflect how she is portrayed and what we are told about her in the Author’s Note: “Martha Gellhorn went on to become one of the twentieth century’s most significant and celebrated war correspondents, reporting on virtually every major conflict for sixty years—from the Spanish Civil War to the Bay of Pigs, from Vietnam to El Salvador to Panama, where she covered the invasion at the age of eighty-one. “ She also wrote novels and essay collections. The book mostly covers the time that Gellhorn was with Hemingway and while I love several of his novels, there were times it was difficult to read about their relationship. He is portrayed as the scoundrel we know that he could be - cheating on his wives, drinking, needy and self centered. A talented writer with so many issues. Even though Hemingway was married, the truth is that she was a clearly in love with him. I found her to be fascinating, mostly when she is on her own away from him, as she experiences the horrors of war when she goes to Finland, talks to the Russian pows or on Omaha Beach. She really had some guts to do this, in particular at a time when this was not what women did. At best a biographical novel can give a feel of who the person is and I felt as if I got to know the woman Gellhorn was. While Hemingway is, of course a big part of this time in Gellhorn’s life, this was Martha’s story. Thanks once again to my reading buddies Diane and Esil , whose perspectives I always enjoy hearing. When I first started this, although I enjoyed the history of the Spanish Civil War, I wasn't all too sure I would like this. The writing seemed somewhat emotionless, matter of fact, pragmatic,but then something changed. I found Martha fascinating, and the descriptions of Cuba were gorgeous, and I settles into this novel. So much history is covered, Gelhorn determined to be everywhere and chronicle everything, all the while dealing with Hemingway and his mood changes,and trying to write her own b When I first started this, although I enjoyed the history of the Spanish Civil War, I wasn't all too sure I would like this. The writing seemed somewhat emotionless, matter of fact, pragmatic,but then something changed. I found Martha fascinating, and the descriptions of Cuba were gorgeous, and I settles into this novel. So much history is covered, Gelhorn determined to be everywhere and chronicle everything, all the while dealing with Hemingway and his mood changes,and trying to write her own book. This was a read with Angela and Esil, and these are just some thoughts I posted during our discussion. Hemingway was in many ways his own worst enemy. He was bipolar, his drinking didn't help, and he honestly could not be alone. He was,however, a talented man and did his best to love his sons. Martha was amazing, such drive, all the places and battles she personally saw and wrote about. Glad she had the guts and fortitude to leave him, though she did love him. McClain did a great job here, detailing her inner struggle to be something for herself. Hemingway woukd have sucked her dry. She was the only wife who would leave him. The author note was wonderful and how much she admired Martha shone through. So I ended up liking this more than I thought I would and enjoyed watching Martha gain confidence and come into her own. Happy Publication Day to Love and Ruin! Love and Ruin is exactly the kind of historical fiction I can sink my teeth into because of the time period, the characters, the flawless writing, and the tumultuous love story between Martha Gellhorn and Ernest Hemingway. Hemingway is a favorite author of mine, and I’m always game to learn more about his life. My high school English teacher assigned A Farewell to Arms for summer reading, and he was a fan of Hemingway’s works and so enthusiastic to share this reading experience with us that I was quickly enamored, too. I related to some aspects of Martha Gellhorn’s character right away. She wants nothing more than to please her father with her writing and for him to see her as a success. Even after his death, this drives her and propels her forward. Martha is a strong and unusual woman, especially for her time. The Author’s Note provides further insight into Martha’s life. Martha Gellhorn, a journalist and award winning war correspondent arrested for going to places “in the field” where she was not allowed, is both intriguing and inspiring to me. What transpires in her marriage and its resulting falling apart had me transfixed. Gellhorn and Hemingway compete for jobs, vying for attention and acceptance. At this point, Hemingway’s life is becoming more unwound and unstable. The love and obsession between Martha and Ernest was palpable and electrifying, and as is the case with many marriages and affairs, sometimes from the greatest of highs, the greatest of lows are found in the end. Overall, Love and Ruin is a beautifully written account of the non-traditional love story between a formidable woman and a formidable man. Thank you to Paula McLain, Random House/Ballantine, and Netgalley for the ARC. Love and Ruin is available now! Love and Ruin by Paula McClain is a 2018 Ballantine Books publication. Vivid and pulsing with atmosphere- but a very challenging read. Wow, Paula McClain can really draw a person into a specific time zone and leave them mesmerized by the political climate, the danger, the romance, and larger than life characters the book is centered around. I loved ‘The Paris Wife’, the fictional account of Hemingway and his first wife. The suspense in TPW was on a more personal and emotional level. But, with Ma Love and Ruin by Paula McClain is a 2018 Ballantine Books publication. I loved ‘The Paris Wife’, the fictional account of Hemingway and his first wife. The suspense in TPW was on a more personal and emotional level. But, with Martha ‘Marty’ Gelhorn, the tension comes from a variety of circumstances, but emotion is pretty far down on the list. Marty was an author and journalist in her own right. She was a well- known and respected war correspondent covering the Spanish Civil War. Falling in love with Ernest Hemingway, a married man, was not on her agenda, but nevertheless she embarks on a long and tumultuous affair with him and eventually he leaves his second wife, Pauline, marrying Martha almost immediately after the divorce was final. This book chronicles Marty’s life during her “Hemingway’ years, from their first meeting, to all the adventures they experienced and survived together, to their marriage, and the eventual breakup. The author did an amazing job of recreating the atmosphere of pre-world war two, the Spanish War, the many places in which Marty traveled to, and of course Hemingway’s Key West and the home Marty and Hemingway purchased and renovated in Cuba. She also created interwoven textures between Hemingway and Martha's struggle with her status as his lover, not his wife, and her own ambitions. The book covers the time frame in which Hemingway wrote and published ‘For Whom the Bell Tolls’, and the way the success of that novel forced a wedge between them. However, the book, as comprehensive as it needed to be, was a real challenge for me at times. I loved the history and felt the relationship development was very well done and realistic. But, Hemingway could be so disagreeable and downright mean. I didn’t care for Marty either on a personal level, disliking the way she acquiesced to Hemingway at times, and her apathy towards breaking up his marriage. So, despite all the rich details and the lush, dangerous atmosphere the novel captured so vividly.I often felt irritable with the characters. While this may be a fictionalized accounting of events, you still can’t totally rewrite history or make the characters likeable, if they really aren’t. Still, Hemingway, warts and all, is such an intriguing person to characterize and Marty, who held her own against his rising popularity in the literary world, perhaps threatened his ego more than anyone else he was romantically associated with. Yet, she did struggle internally with her role as his lover and wife, a common conflict, as her career dueled against the typical role for women, and eventually forced Marty into a fateful decision. I admired Marty’s journalism career and her bravery, however, and believe she was a trailblazer, influencing war correspondence for many years. The book is interesting, but on an emotional level it didn’t quite grab me in the same way ‘The Paris Wife’ did. Still, this a worthy fictional accounting of Martha and Ernest Hemingway, and is informative, and even thought provoking. Bookish Ally Another one I’ve put on my TBR. Thanks Julie! Always appreciate your reviews and insights! Julie Bookish Ally wrote: "Another one I’ve put on my TBR. Thanks Julie! Always appreciate your reviews and insights!" Thanks to Ballantine Books and NetGalley for sending me this e ARC. This book is a fictionalized story of the relationship/marriage/divorce between Martha Gellhorn and Ernest Hemingway. Martha was Hemingway's 3rd wife. They started an affair while Hemingway was still married to his 2nd wife. Until I read this book, I was not aware that she wrote several books, in addition to being one of the first woman war journalists. She covered wars from the Spanish civil war to Vietnam and Panama. The book describes Hemingway as a very selfish man. He may have been a brilliant writer, but he was also an alcoholic and an insecure womanizer. Gellhorn was mesmerized by his brilliance but rebelled against his domineering need for her. When she went off on a war reporting assignment without him after several years of marriage, Hemingway found another woman and divorced Gellhorn. Gellhorn was the only 1 of his wives to leave him and he never forgave her. Some quotes: Spanish civil war siege of Madrid "Since the previous November, when Franco had locked his sights on destroying the capital, nearly every day had brought fire and death. But most Madrilenos had still refused to leave." Martha on Ernest and Martha's first sexual encounter: "The trees bent in and the whole night did, too, and whatever part of me could usually hold to reason was washed away." This novel chronicles the journalistic rise of Martha Gellhorn and her relationship with Ernest Hemingway. Maybe I’ve just read too many books about Hemingway and those that he loved, hurt, destroyed, etc. but this book was just an average read for me. Ms. Gellhorn was still struggling to find her career path when she and her family met Hemingway while in vacation in Key West, Florida. He convinces her to come to Spain with him and report on the civil war going on there, she is able to secure a This novel chronicles the journalistic rise of Martha Gellhorn and her relationship with Ernest Hemingway. Maybe I’ve just read too many books about Hemingway and those that he loved, hurt, destroyed, etc. but this book was just an average read for me. Ms. Gellhorn was still struggling to find her career path when she and her family met Hemingway while in vacation in Key West, Florida. He convinces her to come to Spain with him and report on the civil war going on there, she is able to secure a press pass and joins him there. It is while here that she gets her first taste of war correspondence and she likes it. Ernest makes a play for her and even though he is still married to Pauline Pfeiffer with whom he has two sons, they begin a love affair. The interesting part of this book for me was Ms. Gellhorn and her accomplishments. I was so impressed that I spent hours looking up files about her on the internet and it made for interesting reading. I found that she had such a long career that she covered everything from the Spanish Civil War, Vietnam, the wars in El Salvador and Panama. She truly had a love of traveling and getting the story out. I’m ashamed to say that I didn’t know that she had published novels, but I plan to check them out. The love affair, then marriage and then “ruin” of her time with Hemingway seemed like a repeat of so much I had read about him and his exploits before that all I felt was relief when Martha finally divorces him and lives her own life. Of the three books that I’ve read by Ms. McLain I think this is probably my favorite and I would certainly look forward to the next novel by this talented author. This book focuses on Ernest Hemingway’s third wife, Martha Gellhorn. Martha was a respected and celebrated person with many accomplishments. She was a war correspondent for 60 years, and an author in her own right, but the times were such that Ernest Hemingway often overshadowed her. The best parts of the book are Martha's travels as a correspondent, along with the descriptions of the Spanish Civil War, and the events leading up to WWII. She was very driven, independent, and adventurous, but was also empathetic and drawn to the untold stories of the suffering of ordinary people. She was at her best and most alive when she was at the front lines in the midst of the action, and her first-person narration was riveting. Among many other accomplishments she was the only woman to land at Normandy on D-Day, and was among the first journalists to report from the Dachau concentration camp. Martha met Hemingway in Key West, and we follow their courtship, affair, and eventual marriage. Hemingway was a brilliant author but in his personal life he was needy and petulant, a bully who demanded his own way. There are only small sections of the book devoted to Hemingway’s POV, and they were very well done. With Martha’s independent streak and travels that kept her away from home for long stretches, it was inevitable they would crash and burn. Love and Ruin was the perfect title for this book. My one complaint is it got a little angsty at times when talking about their relationship and it began to wear thin. But it still gets all the stars for highlighting Martha's career and accomplishments. The best of historical fiction sends me to the internet to research events and people. This book did exactly that. I read articles on Martha and watched a few videos and also looked up some of the wartime events I was unfamiliar with. What an amazing woman. Highly recommended! I only moderately enjoyed Paula McLain’s last two books, but I had seen other reviews which said this book was better. But I can’t say I found it to be much of an improvement. In the beginning, Martha Gelhorn comes off as the stereotypical socialite rebelling against her background. And for all her talk of independence, Marty never feels complete without a man. She quickly meets Ernest Hemingway and he sweeps her into a different life. I actually had to do the math. He comes off as much older th I only moderately enjoyed Paula McLain’s last two books, but I had seen other reviews which said this book was better. But I can’t say I found it to be much of an improvement. In the beginning, Martha Gelhorn comes off as the stereotypical socialite rebelling against her background. And for all her talk of independence, Marty never feels complete without a man. She quickly meets Ernest Hemingway and he sweeps her into a different life. I actually had to do the math. He comes off as much older than her, when in actuality, there’s just a 9 year age difference. It doesn’t help that he calls her “Daughter”. Initially, I had trouble connecting with Marty. She goes to Spain as a reporter, but it’s ages before she actually writes anything. It doesn’t take long before she becomes Hemingway’s lover. And if I didn’t connect with her, I had nothing but revulsion for him. He speaks of love but he just uses women and obviously thinks nothing of fidelity. The book is at its best when McLain is describing the war scenes, whether in Spain, Finland or during WWII. It only came alive for me when Marty was on her own. It’s at its worst when Marty is describing her lovesickness for Ernest. The sappiness of the writing made me cringe. “His bed was an operating table, and this was heart surgery.” The sections that are written in Ernest’s voice never rang true. Meant to be all emotional and dark, they just fell flat to me and I could never believe it was his voice. The ending is the best part of the book. McLain does a great job of describing the downward spiral of their marriage. And the author’s note, which tells of Gelhorn’s later years, seemed to capture her spirit best of all. My thanks to netgalley and Ballantine Books for an advance copy of this novel. I don’t usually react to books based on my like or dislike of characters. I can dislike a character but love a book because it is well written. In this case, somehow my dislike for Hemingway — as a person, not an author — affected my reaction to Love and Ruin. The novel is a fictionalized account of a few years in Martha Gellhorn’s life. She was married to Hemingway for four years around World War II. Gellhorn herself is fascinating. She was a war correspondent for most of her life —clearly fearless and outspoken. The historical and geographical contexts are fascinating — starting in Spain during the Civil war, also set in Cuba, and then in many parts of Europe during WWII. But I just couldn’t get my head around what attracted Gellhorn — such an independent and strong woman — to Hemingway. He seemed so needy and self-absorbed. Ultimately, Gellhorn left Hemingway in part because she was tired of how the press focused on their relationship, rather than her writing and what she had to say. To me, there’s something ironic in the fact that McLain reproduces this focus by fictionalizing this part of Gellhorn’s life. I would have been more interested in a novel about her that didn’t mostly zoom into her marriage to Hemingway. Surely, one of the most interesting things about her is that she spent most of her life as a war correspondent and not that she was married to Hemingway for four years? Still, I appreciated the depiction of Gellhorn’s personality and the historical context enough to give this one 3.5 stars. This book could easily have been a slam dunk for me - two celebrated and iconic historical characters falling in and out of love against the backdrop of World War II. Martha Gellhorn and Ernest Hemingway live huge lives, working and traveling the world in some of the most turbulent times in modern history. Both of their stars are rising; Gellhorn as an author and war correspondent and Hemingway at the peak of his career as the celebrated author of "For Whom The Bell Tolls." Gellhorn wants love a This book could easily have been a slam dunk for me - two celebrated and iconic historical characters falling in and out of love against the backdrop of World War II. Martha Gellhorn and Ernest Hemingway live huge lives, working and traveling the world in some of the most turbulent times in modern history. Both of their stars are rising; Gellhorn as an author and war correspondent and Hemingway at the peak of his career as the celebrated author of "For Whom The Bell Tolls." Gellhorn wants love and a fulfilling career. Hemingway wants love and a sycophant wife. We have world conflict. We have romantic conflict. We have the Americas, Europe, Asia, and a tropical love nest in Cuba. And yet, if you asked me to describe this book in one word, it would be "bland." McLain writes very well and I thought she did a nice job of creating the atmosphere of a world being swept into war in the 30's and 40's. I just could not connect at all with Gellhorn. Gellhorn is the narrator and she explains what she is seeing and how she is feeling, but for the most part, it did not translate into any emotional affinity. I had little sense of her real personality. Without that engagement with the main character, I felt only a cursory interest in the story. By contrast, McLain's Beryl Markham character in "Circling the Sun" had me so hooked that I fell down rabbit hole after rabbit hole, reading everything I could get my hands on about Markham after I finished McLain's book. For me, this was a solid 3-star. I liked it, but didn't love it - something vital that glues the reader to the page was missing. Thanks to NetGalley and Random House Publishing for an ARC of this novel. My review, however, is based on the hardcover version. The author, Paula McLain, has made a career writing historical fiction memoirs. Her most popular novel, “The Paris Wife” is a fictionalized account of Ernest Hemingway’s marriage to Hadley Richardson. Hadley is Ernest’s starter wife. He had four wives by the time of his death. While married to Richardson, Hemingway wrote, “A Moveable Feast,” his classic memoir of Paris in the 1920s. In McLain’s next novel, “Circling the Sun,” she writes in the voice of Beryl Markham, a British-born Kenyan aviator who became the first woman to fly solo, nonstop across the Atlantic. In “Love and Ruin,” McLain once again comes back to Hemingway. This time, the narrator is his third wife, Martha Gellhorn, known as Marty. As in her other books, it is clear that the author did her homework by researching previously published biographical material on her heroines. “Love and Ruin” are words that seem to be twin preoccupations in life and literature. It may not be as catchy, but if this book was titled “Love, War and Loss,” the reader would know exactly what they were about to dive into, because the story is about the carnage of war and the ruin of a marriage. Marty Gellhorn is considered one of the most important war correspondents of the 20th century. She meets Hemingway in late 1936, in the now infamous “Sloppy Joe’s Bar,” located in Key West, Florida. The bar was a favorite watering hole for the writer. (I’m proud to say I had a drink there). He invites Marty, and her mother, to his Key West house, where he lived with his 2nd wife and two sons. He had another son from his first marriage. (Since I visited the house, which is now a museum, I can assure you that all details are accurate, right down to his wall art, which are movie posters of his books that became films). When Marty hears his plans to travel to Spain as a war correspondent covering the takeover of Spain by Franco, she decides to meet him there. It is during this journey that she discovers her love of adventure. It is also here that the couple’s love affair begins. Hemingway’s experiences in Spain were his inspiration for his book, “For Whom the Bell Tolls,” which he wrote in their home in Cuba. I wonder if he needed a woman in his life to write his most famous novels. Ernest Hemingway truly was a larger-than-life individual. He was also a misogynist alcoholic. His career hit an all time high with “For Whom the Bell Tolls,” while Marty, also a writer of novels, only received notice as Hemingway’s wife. Ernest’s “Bell Tolls” became a movie and they went to Hollywood, California to be on the set. She hated everything about Hollywood. But Earnest was in his glory with all the attention and becoming buddies with Gary Cooper and Ingrid Bergman. She believed that in order for her to breathe, she needed to get away from Ernest’s needy ego. This was the beginning of the end of their marriage. Determined not to live in the shadow of her famous husband, she accepted dangerous war journalist assignments overseas. Realizing her true passion comes from on-the-ground reporting. She decides to cover D-Day by stowing away on the first hospital ship to land at Normandy, wading ashore to become the first journalist, male or female, to make it there and report back. I found her to be a brave and amazing woman. Unfortunately, her husband saw her leaving not as a work assignment, but as her leaving the marriage. He started the divorce process. You have to love Marty, even though he filed the papers, she was his only wife to leave him. She was heartbroken to read in the newspaper that he already had another woman living with him in their Cuban home. It is hard to like Hemingway, but through Marty’s voice, the author does a great job of describing his deep depressive episodes. For anyone who knew the man, his suicide was not a surprise. Even after their divorce, Marty still worried about her self-destructive ex. As the reader, I wondered if Hemingway would have had a better life if he hadn’t become so famous. Reading Marty’s first-hand view of war was engaging as well as traumatic. I very much enjoyed the history lesson through the heroine’s thoughts. But, I also felt her feelings on the horrors she witnessed in war, which could be tough. Maybe, this is why I so enjoy historical fiction memoirs. You feel like you are getting inside the head of the narrator, and McLain does this genre extraordinarily well. I should mention that the author has lived an interesting life. She wrote her own memoir, “Like Family: Growing Up in Other People’s Houses.” McLain’s parents abandoned their children. She and her two sisters grew up in foster care homes. Even if you do not care for fictional memoirs; I strongly recommend that you give the well written “Love and Ruin” a try. It has a something for everyone, no matter your favorite genre. Love and Ruin is historical fiction centered around Martha Gellhorn, her career and her relationship with Ernest Hemingway. I knew little of Gellhorn before reading the book, but liked her character quite a bit in the story. Both Gellhorn and Hemingway are writers, meeting in Key a West while Gellhorn is on a family trip. They both travel to Spain on journalistic assignments during WWII, where their romance begins, and eventually settle in Cuba. Their relationship is tumultuous with many ups and Love and Ruin is historical fiction centered around Martha Gellhorn, her career and her relationship with Ernest Hemingway. I knew little of Gellhorn before reading the book, but liked her character quite a bit in the story. Both Gellhorn and Hemingway are writers, meeting in Key a West while Gellhorn is on a family trip. They both travel to Spain on journalistic assignments during WWII, where their romance begins, and eventually settle in Cuba. Their relationship is tumultuous with many ups and downs. My knowledge of Hemingway is limited and I know McClain’s books are fictional, but his appeal is lost on me, especially after reading two books focused on two different relationships with him - This one, and The Paris Wife, which was a decent read but I just wasn’t in love with it like many others seemed to be. I enjoyed Love and Ruin much more, in part because I found Gellhorn more interesting and relatable than Pauline. "Why is it that a man can do his work and just get on with it, but a woman has to drop everything for her place at home or else she's selfish?" I actually liked this book more than I expected because it focused on the frequently-faced problem of whether a woman can still have a career after marriage. Martha Gellhorn was a budding war correspondent when she met Ernest Hemingway, who was nine years her senior and already on his second wife with whom he had two sons. Judging Hemingway by today's se "Why is it that a man can do his work and just get on with it, but a woman has to drop everything for her place at home or else she's selfish?" Judging Hemingway by today's sexual behavioral standards, especially from #MeToo's perspective, he could definitely be accused of sexual harassment in the way he came on to Gellhorn while they were covering the Spanish Civil War--lurking outside her room, whispering and knocking at the door like a dog in heat, coming in uninvited, plying her with whiskey. Sure she fell for him, but that doesn't much excuse the behavior! Hemingway admittedly gave Gellhorn a leg up professionally but once they were married, things soon became competitive and Martha's writing was often compared to Ernest's. Can two writers and their egos make a successful marriage? Apparently not. "Love and Ruin" is a fitting title! Hemingway began talking about having a daughter with her since he already had three sons, but Martha wasn't much interested. He wanted his wife to stay home by his side but Martha had had the wanderlust since she was a child. What he admired in her before they were married, he now wanted to change. He wanted to tame her, enchain her. I'm glad this book wasn't so much about Hemingway as about Gellhorn who went on to become a famous war correspondent, journalist and writer in her own right. The best parts of this novel are those in which Martha is experiencing war firsthand, talking to people and reporting on their experiences for Collier's. "I'm interested in people. Governments and world leaders should be punished. Not men." McLain limited Hemingway's pov to small, infrequent sections that really didn't add much to the story. He had such a big personality and ego--he could easily take over any situation. But he'd met his match in Martha Gellhorn and didn't much like it when he couldn't mold her to fit his vision of what a good wife should be. There are some people who are driven. It can become an obsession that ultimately destroys what is good, what is needed, and even love if it is allowed to continue unabated. For Ernest Hemingway, his obsession with life and writing was eventually something that would be his downfall. He was a person who believed himself to be bigger than life, perhaps even better that life itself. He was in so many ways his own sunshine and the people who fell at his feet nurtured that in him. When he meets and falls in love with Martha Gellhorn, still being married to his second wife Pauline, they embark on a journey that will ultimately leave the both of them bereft and adrift. For Ernest, he easily moves on to the next Mrs Hemingway, but for Martha driven herself to be the competitor in Ernest's life, she seems to always be burdened with finding the next windmill to battle. For Ernest if you didn't love him and acquiesce to his needs, you were thrown out and dismissed, not one to be trifled with. He was so caught up in himself that he neglected to see others. He was the ultimate man's man, a person who men wanted to be and women wanted to be near. Martha was a woman who wanted desperately to be independent, be her own person, go her own way. The fact that they were both writers and ultimately competitors was a prophet of doom foretelling where this union would end. Martha was also a driven person. She always was looking to insert herself into danger, into situations where people were obsessed with the throes of wartime and warfare, also chasing that dream of being acknowledged, being worthy meaning something other than being Mrs Hemingway. They were happy for a time. They fed into each other's egos, but the writing was on the wall and as they both struggled for recognition, they forgot the things that brought them together. Jeremy Irving once said "Determination becomes obsession and then it becomes all that matters" To Martha and Ernest the fire, the love, the obsession they once had for one another originally burnt too bright for it not to eventually fizzle and die. Thank you to Paula McLain who in her books has made the Mrs Hemmingways become alive to this reader and both Ballantine Books and Netgalley for making an advanced copy available to me. (3.5) This is the weakest of the three McLain novels that I’ve read, but when we’re talking about a writer of this caliber that isn’t actually so much of a criticism. It’s strange to me that, having written a novel from the perspective of Hadley Richardson, Ernest Hemingway’s first wife (The Paris Wife), McLain would choose to tell the story of another Hemingway wife – this time Martha Gellhorn, a war reporter and author in her own right. When excellent books like Naomi Wood’s Mrs. Hemingway a (3.5) This is the weakest of the three McLain novels that I’ve read, but when we’re talking about a writer of this caliber that isn’t actually so much of a criticism. It’s strange to me that, having written a novel from the perspective of Hadley Richardson, Ernest Hemingway’s first wife (The Paris Wife), McLain would choose to tell the story of another Hemingway wife – this time Martha Gellhorn, a war reporter and author in her own right. When excellent books like Naomi Wood’s Mrs. Hemingway are out there, why go back over the same ground? The only problem was that I got a little bogged down in the many settings and events. Perhaps by being too inclusive, McLain missed a chance to take more time over certain scenes. This is a book about Martha Gellhorn’s years of marriage to Ernest Hemingway. Her life (1908-1998) has been in many ways eclipsed by his (1899-1961). She became Hemingway’s third wife, the first being Hadley Richardson married to Ernest Hemingway from 1921-1927, the second being Pauline Pfeiffer from 1927 to 1940, the third being Martha Gellhorn from 1940 to 1945 and finally Mary Welsh Hemingway from 1946 to 1961. Th book is divided into parts, each dated and in chronological order, starting in J This is a book about Martha Gellhorn’s years of marriage to Ernest Hemingway. Her life (1908-1998) has been in many ways eclipsed by his (1899-1961). She became Hemingway’s third wife, the first being Hadley Richardson married to Ernest Hemingway from 1921-1927, the second being Pauline Pfeiffer from 1927 to 1940, the third being Martha Gellhorn from 1940 to 1945 and finally Mary Welsh Hemingway from 1946 to 1961. Th book is divided into parts, each dated and in chronological order, starting in January 1936 and ending in June 1944 with the D-Day invasion in France. This allows the reader to place all that happens in a timeframe of historical world events. Deemed one of the great war correspondents of the 20th century, any book about Martha must also focus upon world events, making the book’s chronological timeframe appropriate. Martha came to report on virtually every major world conflict during her sixty-year career as a journalist. We follow from when Ernest and Martha meet at Key West. We observe how their attraction and love for each other grows, particularly in Spain during the Spanish Civil War. We are with them in Cuba, out west in the US and in China and in France and other places too. Child escapades of her youth correctly predict that Martha would one day become a word traveler. We watch their love grow and then disintegrate. In 1944, they both know their marriage is on the rocks and would soon end. In June, Martha is on Omaha Beach, and Ernest is not. She is the only woman of 100 000 men there. She was the first journalist to be there and the first to report back. Ernest and Martha were both passionate human beings, both journalists and both authors. Both had goals they aimed to achieve. Their relationship had to be tumultuous. I like very much Ernest Hemingway’s manner of writing. This led me to want to know more about the man. The more I have come to learn about him the less I am endeared, but this cannot negate my appreciation of his prose. I like its strength and simplicity. Despite my distaste for the man, he was clearly attractive to many women. What was his charm? Why did so many women fall for him? This is why I picked up the book. None of the many other books I have read have made this clear to me. Would I get an answer? I do think the book shows how it came to be that Ernest and Martha fell in love, what drew them together and what pushed them apart. The writing at the beginning gave me problems. I was seriously considering dumping the book. Diane, a GR friend, advised me to continue until the setting had shifted to Cuba, and this I did. The writing does improve, just as she said. At the beginning the prose is often cliched and trite. What the characters were saying to each other were words that would not be said in real life. Listening to an audiobook reveals poorly drawn dialog quickly. Perhaps the author is just better at drawing individuals with conflict in their lives. Conflict certainly comes to the fore as the relationship between Ernest and Martha develops. Their struggle to make their relationship work is very well drawn. We see each one’s weaknesses and strengths. Their behavior toward each other feels genuine and real. Rivalry, conflicting personal ambitions, jealousy and love all rolled together—what is drawn is life as it really is. This is a book of historical fiction. In the book’s author’s note we are told of her source material. The books mentioned are now books I would like to read. In my view, the author has drawn an accurate and perceptive understanding of how Ernest and Martha interacted, as well as Martha’s relationship with Ernest’s three sons. The author’s note is preceded by an epilog. Together they briefly summarize salient points in the remaining years of Martha’s life and Ernest’s and Martha’s death by suicide. The information provided is adequate, neither too long nor too short. The audiobook is narrated by January La Voy. I wasn’t enthralled in the beginning, but I think this was a reflection of the initial poor writing spoken of above. When the writing gets on track, so does the narration. I grew to like the narration a lot. I have given La Voy’s performance four stars. Don’t dump this, or any other book, too soon. Books can turn around. I ended up liking Love and Ruin a lot. If you read this book you come to understand a bit more about Hemingway, a lot about Martha Gellhorn and a lot about their relationship. Now I want to read some of Gellhorn’s books.. I will start with The Face of War. The woman fascinates me. She sought to strip words to the bone to speak the truth. She was emotional and passionate and raged against world injustices, and I think she was a very good mother to Ernest’s sons. She is a great example of a good stepmother. I find her, maybe not perfect, but admirable in many ways. I received an advanced review copy of this book from Netgalley in exchange for an honest review. This does not affect my opinion of the book or the content of my review. Legendary twentieth century journalist Martha Gellhorn did not wish to be remembered as “Mrs. Ernest Hemingway.” “Why should I be merely a footnote in his life?” she asked. What might she think then of Paula McLain’s Love and Ruin, a novel that casts the third Mrs. Hemingway as a starry-eyed, adulterous bed- and continent-hopping I received an advanced review copy of this book from Netgalley in exchange for an honest review. This does not affect my opinion of the book or the content of my review. What might she think then of Paula McLain’s Love and Ruin, a novel that casts the third Mrs. Hemingway as a starry-eyed, adulterous bed- and continent-hopping writer who one day quite literally walks into a bar and falls hard for the greatest living celebrity novelist of her time? During her 40-year career as an author and war correspondent, Gellhorn distinguished herself in many ways, among them as the only woman journalist to land at Normandy with the 1944 D-Day invasion and as one of the first to report from Dachau concentration camp after its liberation in 1945. Yet in Love and Ruin, her character spends much of the book mewling about her rather dull and predictable relationship with the older married alcoholic Hemingway who, history knows, was better at amassing literary achievements than marital successes. Gellhorn should be a fascinating character. What makes the beautiful, educated daughter of a St. Louis doctor quest across the world in the 1930s to write and report from the front lines of war? Like pilot Amelia Earheart, writer Lillian Hellman, and First Lady Eleanor Roosevelt, all of whom get mention or cameos in Love and Ruin, Gellhorn was a trailblazing woman ahead of her time. But what was the fuel that lit her internal pilot light, and what inspiration can we draw from such dedication to a life’s work? McLain’s book stays notably uncurious on this topic, devoting itself instead to the mundane affair with Hemingway and to Gellhorn’s cycle of antsy escapism back to Europe where her work seems at times, between lovelorn glum spells, to have written itself. McClain clearly admires and empathizes with Gellhorn, and her well-researched writing is smooth and readable. Oddly, however, it is the author's post-text acknowledgements, not the novel itself, that offer true insight into Gellhorn. 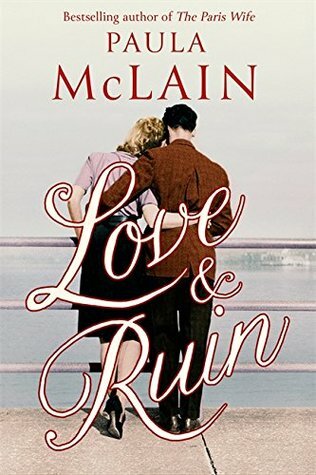 I was indifferent as I read Love and Ruin; I cried when I read McClain’s final notes. In those closing paragraphs by a modern female writer about this pioneer , I was overwhelmed by the contributions and passion of two writer women. This was the story beneath the surface of Love and Ruin. I wish it was the story McLain had told. I just want to say before I review LOVE AND RUIN by Paula McLain that I read CIRCLING THE SUN by the author a couple of years ago and it's one of those books that I fell in love with and I still remember how great the reading experience was. I have yet to read THE PARIS WIFE (it stands and looks accusingly at me on a shelf at home), but I hope to get to it one day. If I’m perfectly honest I had never heard of Martha Gellhorn until I started reading this book. I also knew little about Ernest Hemingway beyond his home in Key West Florida, the six-toed cats he kept or his boat, Pilar. Of course, I knew his novels – though I have never read any of them. So you might be wondering what made me read a book about the life of a woman I’d never heard of before and her love affair with a man I knew little about? Truthfully, I crave knowledge and although this is a dramatised fictional account of Martha Gellhorn’s real life, the events that occur really did happen, so I was intrigued. The book is split into six sections starting in January 1936 and ending in June 1944. Martha was an inspirational woman who from an early age knew she didn’t want to be tied down, she wanted to travel, to make a difference. She wanted to be an accomplished writer and more importantly, she wanted her father’s approval of her writing, something he refused to give her, telling her there were two types of women in the world and she was the other kind. Harsh words for any young woman to have to deal with, but especially hard when said just before her father’s death. Martha met Hemingway on a holiday to Florida with her mother and brother after the death of her father. He invited her to be a correspondent on the Spanish civil war. After getting a friend from a magazine to give her papers to say she worked for them, she made her way to Spain, meeting up with Hemingway and his associates in Madrid. It was here that her love of journalism took off. It was also where she started to fall for Hemingway, even though he was married to his second wife Pauline at the time. The book follows Martha’s life and the love affair that the two eventually began. At the back of the book is a note from the author that give us an insight into Martha’s life after the book. It seemed to me that the love of these two people, even for a short while, haunted her for the rest of her life, as she avoided him until his death and then his name or anything to do with him afterward. Martha Gellhorn was an accomplished war correspondent and writer, as well as the third wife of Ernest Hemingway. Paula McLain's "The Paris Wife" introduced us to Hadley Richardson and Pauline Pfeiffer, Hemingway's first and second wives. "Love and Ruin" is a novel covering the years when Gellhorn and Hemingway were together. Gellhorn and Hemingway met at a Key West bar, and became good friends. He encouraged her to journey to Spain to report on the Spanish Civil War in 1937. As a journalist Gellh Martha Gellhorn was an accomplished war correspondent and writer, as well as the third wife of Ernest Hemingway. Paula McLain's "The Paris Wife" introduced us to Hadley Richardson and Pauline Pfeiffer, Hemingway's first and second wives. "Love and Ruin" is a novel covering the years when Gellhorn and Hemingway were together. Gellhorn and Hemingway met at a Key West bar, and became good friends. He encouraged her to journey to Spain to report on the Spanish Civil War in 1937. As a journalist Gellhorn's emphasis was personal stories such as families affected by the Depression, tragic stories from bombed cities, or an interview with a prisoner in a POW camp. The novel has good descriptions of the life of a journalist, and a wonderful sense of the places they visited. Gellhorn and Hemingway lived together in Cuba, and married after he obtained a divorce. Hemingway is presented as a talented writer with a "larger than life" personality. He was a sportsman with many friends. However, he was also a moody, self-centered man who started drinking at lunch and continued for the rest of the day. Gellhorn was attractive and brave, venturing into a man's world in her work as a war correspondent. There was conflict between them because Hemingway wanted a wife at home, but Gellhorn loved the excitement and challenge of her career. They each wanted something different from the marriage. I am weary of reading about characters that I don't care about and this book has no one I really enjoyed with the exception of Martha Gellhorn's mother. I have long thought of Ernest Hemingway as the Harvey Weinstein of his generation and this book did not change my mind at all. He has no trouble sleeping around on his wife (which ever one it is at the time) and thinks the world revolves around him. He calls them nicknames like Mother, Daughter, or Rabbit. All diminish them as a person. Still , I am weary of reading about characters that I don't care about and this book has no one I really enjoyed with the exception of Martha Gellhorn's mother. I have long thought of Ernest Hemingway as the Harvey Weinstein of his generation and this book did not change my mind at all. He has no trouble sleeping around on his wife (which ever one it is at the time) and thinks the world revolves around him. He calls them nicknames like Mother, Daughter, or Rabbit. All diminish them as a person. Still , you have to wonder about women who think things will be different with them. They sleep with a married man and think he won't cheat on them. Really? Two marriages behind him and all of a sudden he is going to straighten up and fly right. How did that work out. But I think Martha had more on her agenda than Hemingway's affections. She was an aspiring author who was really going nowhere. She immediately started using his connections. First the war in Spain happened and Hemingway goes off to cover it. He tells her how to get credentials and although he doesn't pay for her plane ticket, he pays her expenses over there. He houses, feeds and beds her. She gets a story and is satisfied. It goes on and on from there. He finances her and makes introductions and clears a path for her. He does it there entire relationship. She owes everything to him. She also has this mistaken belief that annoys the heck out of me. She says, I work hard so I deserved it. No. Lots of people of people work hard and don't get special rewards for it. You won't succeed without working hard but working hard doesn't guarantee success. The Nazis worked hard and that didn't work out. Stop it. It reminds me of when I was a child and complained to my mother that it wasn't fair. My mother said to me, who ever told you life was fair? Same idea. The only part of the book that was really interesting to me was the disintegration of the marriage. I found that really authentic. Trust me that there was a lot of whining on Martha's part. She was a world class whiner. It makes me wonder how she actually covered wars although having someone house and feed you helps out a lot on that front. Overall, this book did not paint a picture of anyone I liked or admired. I was disappointed. 4.5 STARS. Caution: there are spoilers if you don't know the story of Gellhorn and Hemingway. Paula McLain is one of my favorite authors. Writing is like channeling. Scratch that. Writing is channeling. Paula M has done this with her new book Love and Ruin. I loved The Paris Wife and Circling the Sun and looked forward to Ms McLain’s latest book which jumps a wife, from Hemingway’s first, to his third, Martha Gellhorn. It seemed as though it was a case of ‘what goes around, comes around’ for Fif 4.5 STARS. Caution: there are spoilers if you don't know the story of Gellhorn and Hemingway. Paula McLain is one of my favorite authors. Writing is like channeling. Scratch that. Writing is channeling. Paula M has done this with her new book Love and Ruin. I loved The Paris Wife and Circling the Sun and looked forward to Ms McLain’s latest book which jumps a wife, from Hemingway’s first, to his third, Martha Gellhorn. It seemed as though it was a case of ‘what goes around, comes around’ for Fife, the second one who had, according to The Paris Wife, stolen ‘Hem’ from Hadley who did not deserve it. Life can be such a beach sometimes. I Iike the way McLain portrays both writers. She captures their essence. I felt at times that Gellhorn was just as self-centered as Hemingway. Probably all writers are--well most, then. They sit in their own little worlds pounding out their little darlings and we can’t kill them can we? And when the criticism drops like a wet blanket they feel as though they’ve had their throats cut by fools who just don’t get it. I think Paula conveys the goings-on in the writer’s mind very well – as she, of course, would know only too well. Part of the tale tells of Hemingway’s struggle in writing his masterpiece. Strange thing is, I tried once to read For Whom the Bell Tolls and could not get on with it. Shows what a moron I must be. When the dialogue of Spaniards resorted to Elizabethan English I was put off. Now it seems I must revisit that book and try again—and maybe I will get it. Hemingway certainly is one of my favorite authors. I loved The Old Man and the Sea and The Sun Also Rises as well as his short stories. His writing from the twenties onward was groundbreaking. Hemingway says to Gellhorn, ‘to write dialogue—listen’. I don’t know whether Paula M put these words in Hemingway’s mouth, or whether she found a real quote, but I know it to be true. When a writer listens, it becomes like taking dictation. I also enjoyed McLain’s description of Gellhorn writing ‘The End’ when she’d finished one of her novels and showing it as a great moment. To write these words is an incredible moment for a writer, especially for their first book, as is later holding the work in book-form for the first time. These were just some small things I enjoyed which Ms. McLain made real. Paula McLain brought the section covering Cuba to life—the sea, the air and the landscape. She captured the feel of the Caribbean, Florida and Cuba. You see the smooth, warm water and feel the clammy air early in the mornings as the sun peaks above the horizon and hangs over the sea. Those were times I loved best myself. You savor the moment. You know it’s going to be a hot one. I’ve stood in Hemingway’s house in Key West and seen his cats (their offspring). Now this book has made me want to visit the Finca, the house Gellhorn refurbished and made into their home in Cuba, I think a home where Hemingway was never happier—that is, until Gellhorn went off to traipse the battle fields of Finland and Europe. This he found disloyal. He needed her beside him. But two writers under one roof, each wanting the limelight and the adulation of the world’s readers were bound to have a falling out, eventually. And they did. Hemingway took his revenge, by stealing the sponsor of her war reporting. After all, wouldn’t any magazine rather have the great Hemingway sending reports from the war zones rather than Gellhorn? Even though by now, she was a highly respected war correspondent. It was all about ratings and the bottom line. Later, in London she learns of his new love—who would become his fourth and last wife. It's like a knife in the her heart. Shucks, so many women and so little time for ‘Hem’. But then later, his demons finished him off with a double-barreled shotgun before dawn at his house in Idaho. Was this another case of ‘what goes around, comes around’? Strangely, Martha Gellhorn finished herself off with a pill forty years later—likely due to her cancerous condition. All the trials, tribulations and suffering of life are made real. Congratulations, Paula Mclain. I was awarded this book in a giveaway, so thank you Ballantine Books and thank you Paula McLain. I must have enjoyed this book. I started it Tuesday and finished it Thursday … and I am no speed reader. I so loved this one. Her best yet. Full review to follow. Thank you to #paulamclain, #randomhouse, and #netgalley for my advanced ecopy of Love and Ruin. 1. I know little about Ernest Hemingway except the MOST publicized Thank you to #paulamclain, #randomhouse, and #netgalley for my advanced ecopy of Love and Ruin. 1. I know little about Ernest Hemingway except the MOST publicized facts; suicide, writings, 4 marriages, etc.. I wanted to know more about him and what might make such strong-willed, strong-minded women bind themselves to him. 2. Sadly, all I knew about Martha Gellhorn was that she was a serious journalist and his Hemingway's third wife. I was very curious to figure out how there might be anything romantic about a story that you know starts as an affair and ends with one (or more). Love and Ruin delivered on both accounts. Paula McLain manages to capture both the powerful pull of Hemingway's personality, and the very things about him that would push a person to the point of fleeing him just to breathe, free from his intensity. Interestingly, from MY perspective, this book ended up not really being romantic. You see two people who are like-minded in many ways (something Hemingway tended to be attracted to in all his wives), being pulled together in a time of world-crisis, WWII, and their relationship being brought to ruins just as the war was coming to its conclusion, a very interesting metaphor for their relationship. I could see how ahead-of-her-time Gellhorn was in her obvious struggle to juggle her desire for career with her desire to be a wife and possible mother. I could see that Paula McLain obviously had much admiration for Gellhorn, and for good reason. The woman was brave, strong, and willing to put her very life on the line to put a message out there that the world needed to hear. When we read a book, it is nearly impossible to remove all our own personal beliefs and values as we do so. In my case, I believe that is why I did not find any romance to Love and Ruin. Hemingway was married to his second wife with two young children when Gellhorn made the decision to pursue the relationship with Hemingway. While not uncommon, I don't find it admirable, nor in most cases wise. As intelligent as Gellhorn obviously was, she had evidence that Hemingway could not be satisfied by any one woman, as there was clearly a hole inside himself he didn't know how to fill. On top of that serious lapse in judgement, she almost immediately resented being associated in any way with him as a writer. What did she think would happen if she married the most successful writer of his time? I did empathize with her struggle and anguish as their relationship crumbled. Regardless of how I feel about how their relationship started, I felt sorrow for her knowing the rejection she must have felt to come to the understanding that he loved an idea of her, not the reality. Paula McLain did a wonderful job describing battle-torn areas and the horrors of war that Gellhorn witnessed throughout the book as well as the gorgeous Caribbean locations visited. She also did a great job conveying the inner battle Gellhorn must have faced when trying to decide how much of her own desires to give up in order to be the wife Hemingway seemingly needed. I didn't like The Paris Wife by this author. So I wasn't sure if I'd like this book. But this story of the third wife of Ernest Hemingway is so different. This is a story of Martha Gellhorn, a remarkable woman who “became one of the twentieth century’s most significant and celebrated war correspondents, reporting on virtually every major conflict for sixty years – from the Spanish Civil War to the Bay of Pigs, from Vietnam to El Salvador to Panama, where she covered the invasion at the age of eig I didn't like The Paris Wife by this author. So I wasn't sure if I'd like this book. But this story of the third wife of Ernest Hemingway is so different. The author’s incredible writing reflects a true character of this remarkable woman. This is the first book, which makes me see Ernest Hemingway in a different light as a likeable person. This grasping story, evoking human emotions will linger with you long after you’re done reading. At Key West, while with her family, Marty meets Hemingway. He encourages her to join him to go to Spain and report on war as many others will be doing. In March 1937, she makes her way to Madrid. She travels with Hemingway to different towns lying in ruins, and to battalions observing and talking to soldiers. While absorbing all this, it evokes her senses, putting her objective writing in question. She admires Spaniards for their spirit, still dancing as they say: better to die on feet than knees. Until the beginning of 1939 she travels between US and Europe and continues to report on the situation that the war is no longer a question if it happens, but when. In February 1939, they travel to Cuba, where they change gears and each works on writing a book. Later she becomes his third wife. As she earns her respect as a war correspondent, and is gone for months at a time, Ernest keeps slipping into a darker and darker place as he doesn’t do well on his own. He needs a constant companionship. As she continues to follow her passion and calling, their paths drift apart more and more.